Reportedly, Santa looked to Lexus for help because, in many ways, they emulate his own approach to customer service and the same dedication to getting things done in a timely nature. Of course, Lexus realizes when they have an influential customer on the line, and besides, they had this special project on the back burner ever since they decided to quit producing the LFA supercar. 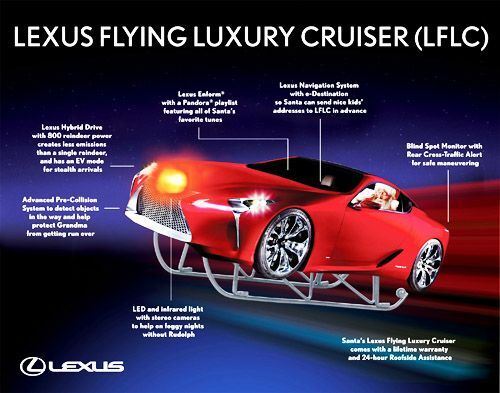 Like other top-flight Lexus models, the LFLC features the advanced Lexus Hybrid Drive system with the power of 800 reindeer, but with less waste production than even a single reindeer. The EV mode allows Santa to stealthily land on each rooftop, maintaining the yuletide’s traditional Silent Night. Blind Spot Monitors and Rear Cross-Traffic Alerts will make Santa conscious of any objects around him despite the distraction of 2 billion kids on his mind, most of which manage to end up in the nice column by year’s end. Advanced Pre-Collision System will warn Santa if he’s approaching any commercial jets or troop transports in his whirlwind efforts to cover the globe in a single day’s night. If Santa approaches any solid object too quickly the LFLC will slow down and stop the Cruiser, making sure the job at hand doesn’t spoil anyone’s Christmas in the efforts to fulfill it. Thanks to the Lexus Navigation System’s e-Destination, Santa can upload all the addresses for the good kids to his Cruiser in advance, and the system will plot the quickest solution to his logistic problems, taking in prevailing winds, sheer and other atmospheric conditions that can be used to his advantage with a little insightful planning. To keep his nerves from getting all jangled up during his busiest night, Pandora will let him access his own North Pole Playlist with all the latest tracks from Rudolph and the Hooftappers, Ben Paved and the Blacktops, NP Cool Elf and Way Cool Blitzen. Oh, we totally forgot the Sugar and Spice Girls! Perish forbid! In foggy weather, a large, red LED and infrared light with stereo cameras will illuminate his path while Rudolph is off frolicking with Vixen in Wakiki. To Lexus, Santa is such an important client that the LFLC comes with a lifetime warranty and Lexus’ 24-Hour Roofside Assistance – so Mrs. Claus can have complete peace of mind while her man’s away. So have a white Christmas with full confidence that neither wind nor snow nor dark of night will keep Santa Claus from his appointed rounds. Merry Christmas to all and to Lexus a good chuckle!